A painful and gruesome story about life in Hiroshima right after the bombing. 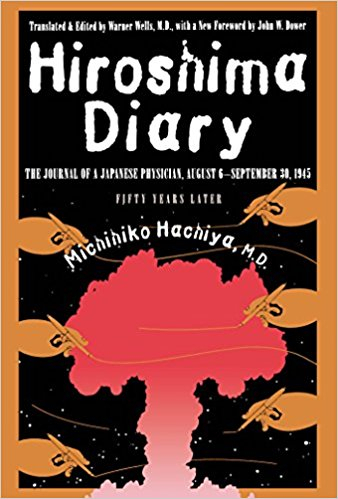 Hachiya kept a diary of his experience nearly dying, then working to save his friends and peers as a doctor working in Hiroshima before and after the bomb went off. A profound weakness overcame me, so I stopped to regain my strength. To my surprise I discovered that I was completely naked. How odd! Where were my drawers and undershirt? Gradually things around me came into focus. There were the shadowy forms of people, some of whom looked like walking ghosts. Others moved as though in pain, like scarecrows, their arms held out from their bodies with forearms and hands dangling. These people puzzled me until I suddenly realized that they had been burned and were holding their arms out to prevent the painful friction of raw surfaces rubbing together. A naked woman carrying a naked baby came into view. I averted my gaze. Perhaps they had been in the bath. But then I saw a naked man, and it occurred to me that, like myself, some strange thing had deprived them of their clothes. An old woman lay near me with an expression of suffering on her face; but she made no sound. Indeed, one thing was common to everyone I saw—complete silence. Miss Kado finished the examination, and in a moment it felt as if my chest was on fire. She had begun to paint my wounds with iodine and no amount of entreaty would make her stop. With no alternative but to endure the iodine, I tried to divert myself by looking out the window. Hiroshima was no longer a city, but a burnt-over prairie. To the east and to the west everything was flattened. The distant mountains seemed nearer than I could ever remember. The hills of Ushita and the woods of Nigitsu loomed out of the haze and smoke like the nose and eyes on a face. How small Hiroshima was with its houses gone. There was no friend or relative to minister to their needs, no one to prepare their food. Everything was in disorder. And to make matters worse was the vomiting and diarrhea. Patients who could not walk urinated and defecated where they lay. Those who could walk would feel their way to the exits and relieve themselves there. Persons entering or leaving the hospital could not avoid stepping in the filth, so closely was it spread. The front entrance became covered with feces overnight, and nothing could be done for there were no bed pans and, even if there had been, no one to carry them to the patients. It was reported that none of the patients had any appetite and that one by one they were beginning to vomit and have diarrhea. Did the new weapon I had heard about throw off a poison gas or perhaps some deadly germ? I asked Dr. Hanaoka to confirm if he could the report of vomiting and diarrhea and to find out if any of the patients looked as if they might have an infectious disease. He inquired and brought word that there were many who not only had diarrhea but bloody stools and that some had had as many as forty to fifty stools during the previous night. This convinced me that we were dealing with bacillary dysentery and had no choice but to isolate those who were infected. In two days I had become at home in this environment of chaos and despair. “O-tōsan, the hall was so full of patients that I could find nowhere to walk without disturbing someone,” she answered, trying to suppress her agitation. “I had to excuse myself every step I took. Oh! it was terrible. Finally, I stepped on somebody’s foot, and when I asked to be excused, there was no answer. I looked down; and do you know what I had done?” “What?” I asked. “I had stepped on a dead man’s foot,” she said and with a shudder moved nearer. People were dying so fast that I had begun to accept death as a matter of course and ceased to respect its awfulness. I considered a family lucky if it had not lost more than two of its members. How could I hold my head up among the citizens of Hiroshima with thoughts like that in my mind? The question as to who among the patients should be moved upstairs provoked lively debate since it seemed at the time that the burned out second floor was far less desirable than the first, despite the crowding. It was finally decided that we, as staff members, should be the first to go up and leave the more desirable ground floor for patients from the outside. I was moved first, and when my stretcher cleared the landing, my inquiring eyes fixed on the stark and twisted remains of thirty-odd iron bed frames, under each of which lay a white ash residue of the straw mattresses that had once covered them. There was not a sound bedframe on the floor, but after the two days spent lying on the concrete floor, the very sight of these beds was magnificent. Yaeko-san and I found beds near each other that were not too badly bent. Our sleeping mats were placed over the frames, and without further ado we were ready to resume life in our new quarters. Dr. Sasada, Miss Susukida, and Miss Omoto joined us, and one by one other members of the staff were brought up until the big room became alive with people. One might have complained about the soot and ashes or about the pipes and curtain rods that hung crazily from the ceiling, but patients never lived in a hospital ward so nearly free of bacteria as this one that was sterilized by fire. For acres and acres the city was like a desert except for scattered piles of brick and roof tile. I had to revise my meaning of the word destruction or choose some other word to describe what I saw. Devastation may be a better word, but really, I know of no word or words to describe the view from my twisted iron bed in the fire-gutted ward of the Communications Hospital. Towards evening, a light southerly wind blowing across the city wafted to us an odor suggestive of burning sardines. I wondered what could cause such a smell until somebody, noticing it too, informed me that sanitation teams were cremating the remains of people who had been killed. During conversation with Mr. Okamoto, I sat up without thinking, from deference to my distinguished visitor. After he left, I suddenly realized that it had not hurt to sit up. If I could sit without pain, could I not stand? I waited until no one was looking and tried, but the stitches in my hip began to pull; so, somewhat crestfallen, I was obliged to lie down. Nevertheless, this experiment inspired me with confidence. Once my stitches were out, I was convinced I could be active again. Today, Dr. Hanaoka’s report on the patients was more detailed. One observation particularly impressed me. Regardless of the type of injury, nearly everybody had the same symptoms. All had a poor appetite, the majority had nausea and gaseous indigestion, and over half had vomiting. One seriously ill man complained of a sore mouth yesterday, and today, numerous small hemorrhages began to appear in his mouth and under his skin. His case was the more puzzling because he came to the hospital complaining of weakness and nausea and did not appear to have been injured at all. This morning, other patients were beginning to show small subcutaneous hemorrhages, and not a few were coughing and vomiting blood in addition to passing it in their stools. One poor woman was bleeding from her privates. Among these patients there was not one with symptoms typical of anything we knew, unless you could excuse those who developed signs of severe brain disease before they died. How then could one account for my failure and the failure of others to hear an explosion except on the premise that a sudden change in atmospheric pressure had rendered those nearby temporarily deaf: Could the bleeding we were beginning to observe be explained on the same basis? One last question I was almost afraid to ask. A rumor was circulating that Russia had entered the war against Japan and was invading Manchuria like a tempestuous flood. Lieutenant Tanaka confirmed the rumor but did not elaborate. Later in the day news came that a mysterious new weapon had been used to bomb Nagasaki with the same result as in Hiroshima. It, too, had produced a bright flash and a loud sound. Pikadon was accepted as a new word in our vocabulary, although some, like old Mrs. Saeki, who had been in the city at the time of the bombing, continued to say simply pika. Those who had been outside the city insisted on saying pikadon. The latter finally won out. Following the news that Nagasaki had been bombed, a man came in from Fuchu with the incredible story that Japan had the same mysterious weapon, but until now, had kept it a strict secret and had not used it because it was judged too horrible even to mention. This man went on to say that a special attack squad from the navy had now used the bomb on the mainland of America and that his news had come from no less a source than General Headquarters. If San Francisco, San Diego, and Los Angeles had been hit like Hiroshima, what chaos there must be in those cities! At last Japan was retaliating! The whole atmosphere in the ward changed, and for the first time since Hiroshima was bombed, everyone became cheerful and bright. Those who had been hurt the most were the happiest. Jokes were made, and some began singing the victory song. Prayers were said for the soldiers. Everyone was now convinced that the tide of war had turned. Since the bomb was said to have exploded near the torii of the Gokoku Shrine, I pedalled in that direction and was surprised to find the torii still standing. Even the medallion in its center remained, but everything else in the area was either destroyed or badly damaged. Nothing is so unstable as a man’s mind, especially when it is fatigued. Regardless of the direction one’s thoughts take, the mind is ever active, ever moving, at times slowly, at times with lightning rapidity. My mind was a confusion of strength and weakness, sometimes fused, sometimes separated. For a few minutes, I lost my head and hastened to the basement where others were assembled. None of the staff was there and I realized if I stayed with so many lying helpless on the wards, I would set a bad example and disgrace the hospital. If death were to visit this hospital again, my place was on the wards. Regaining composure, I left the basement and told everyone I found to get down there as quickly as possible and carry with them all who could be moved. I then took a station in the middle of the hospital. Those who were left gazed out of the windows and listened to the frightful din of planes as they flew over the city. Besides, we had no radio. To me, this was something of a blessing, for being without some of the so-called advantages of civilization gave me a freedom of spirit and action others could not enjoy with their telephones, radios, and newspapers. Having lost everything in the fire and being now empty-handed was not entirely without advantage. I experienced a certain light-heartedness I had not known for a long time. I had been prepared for the broadcast to tell us to dig in and fight to the end, but this unexpected message left me stunned. It had been the Emperor’s voice and he had read the Imperial Proclamation of Surrender! My psychic apparatus stopped working, and my tear glands stopped, too. Like others in the room, I had come to attention at the mention of the Emperor’s voice, and for a while we all remained silent and at attention. Darkness clouded my eyes, my teeth chattered, and I felt cold sweat running down my back. The hospital suddenly turned into an uproar, and there was nothing one could do. Many who had been strong advocates of peace and others who had lost their taste for war following the pika were now shouting for the war to continue. Now that surrender was an accomplished fact, irrefutable and final, there was no soothing the people who had heard the news. With everything lost and no fear of losing more they became desperate. I began to feel the same way—fight to the bloody end and die. Why try to live with a scarred body? Would it not be better to die for one’s country and crown life with perfection rather than live in shame and disgrace? The one word—surrender—had produced a greater shock than the bombing of our city. The more I thought, the more wretched and miserable I became. During the night the “Double Zero” air force detachment from Hiro 1 distributed hand bills which read: “Continue the war!” “Don’t surrender!” As these tokens of resistance were brought in, news came that the Imperial Fleet was attacking in the waters of Shikoku. There were some who considered this good news, but I feared it to be an attempt by some of the younger officers to show an act of bravado to satisfy a grudge. Some patients shouted with joy, but I felt sorrow for those who chose death to surrender. I soon discovered the tendency to subcutaneous hemorrhage was greatest in those who had been near the center of the explosion and that many who appeared to be uninjured were now showing petechiae. Since the spots were neither itchy nor painful, I was at a loss to explain their presence. I also learned that people were flocking to Hiroshima to loot and scavenge. I began my rounds early. The number of deaths had decreased significantly, but each day one or two patients died and in each instance petechiae developed before death. The out-patients were developing petechiae, and today, another symptom became apparent. Many patients were beginning to lose their hair. These people had a bad color and it occurred to me that if we had a microscope, a blood examination might cast some light on the cause for their appearance. The good news came that Mr. Okura’s wife was alive! When the blast occurred, Mr. Okura and his wife were pinned beneath their house. He managed to extricate himself and heard Mrs. Okura crying for help, but before he could reach her the house became a blazing inferno, and he was forced to abandon his efforts to save her. When the fire subsided, Mr. Okura returned to the ruins of his house and found some charred bones near where he had last heard his wife’s voice. Mr. Okura, believing these bones to be those of his wife, brought them back and laid them before the hospital altar. The other day Mr. Okura took the bones to his wife’s family home in the country where he found his wife, safe and unharmed. She had somehow escaped the burning house and was picked up and carried to safety by a passing army truck. No time was lost setting up the microscope and making preparation for blood counts. The six people in our room were found to have white blood counts in the vicinity of 3,000, a little less than half the normal count of 6,000 to 8,000. Some patients had a count of only 500-600, although the majority ranged around 2,000. One critically ill patient had a count of 200, and died shortly after his blood was taken. It became apparent very quickly that patients whose blood counts were low were the ones with the poorest prognosis. Mr. Shiota was our manager and for several days had been back at his post. When he was able to walk, one of the first things he did was to show up with two bags, each of which contained fifty packages of cigarettes. Where and how he got them I will never know, but you can imagine our surprise and delight. I had never seen so much tobacco outside a tobacco store and never dreamed so many cigarettes would come into our possession. For a while, we kept the packages on display the better to enjoy this unexpected bounty. Throughout the hospital habitual smokers drew a breath of relief. Why, a good, strong, working man could do more work with a pack of cigarettes. By the same token, the efficiency of our student helpers could be measurably increased. We could do anything as long as we had an abundant supply of cigarettes. This luxury had become exceedingly scarce in Hiroshima because of its value in barter. We were amazed at Mr. Shiota’s ability. From my window, I watched the people who picked over the goods. There were various ways to take things, I learned. Some would glance furtively about before they took something, whereas others would take an article and then look about. Some would come up, shouting loudly, and rummage through the goods with an air of contemptuous disdain, and seize everything they touched and depart in haste. This little human drama seemed to express the character and training of these people. There were a few who, on seeing the goods, inquired if they might have some. These people made me believe there were still refined people left in the world and I made a mental note to be careful of my behavior. The 210th day was approaching, so we could expect a rainy spell. Since there was no glass in the windows the building soon became thoroughly wet. Here and there, water puddled on the floor, and bedding became damp and musty. Mosquitoes and flies increased our discomfort. I had not bathed since the pika because of my wounds. My thigh wound still looked as if the flesh had been scraped away like paper from a shōji. Accumulated sweat and fat gave me an awful odor and I loathed myself every time my arms and knees came close to my nose. It was sticky this morning and I sweated heavily. After breakfast, I asked old Mrs. Saeki if she would sponge me with hot water. We had no soap, but a little rubbing sufficed to remove masses of dirt and filth adhering to my skin. After the sponge bath, I felt very much better. Alone, I thought of many things. On rounds yesterday, it occurred to me that we had had no tetanus, even in patients whose wounds contained filth and dirt. Why had that been? Had the tetanus germs been killed by the pika or had we overlooked tetanus when everything had been confused and chaotic? I must try to answer this question, I thought to myself. Before the war, a pack of Kinshi cigarettes cost eight sen. When war started, an additional tax of seven sen was imposed, boosting the price to fifteen sen. Later the price rose to twenty-three sen and before the war was over the price had soared to thirty-five sen. Cigarettes were now worth more than money, so I was not the only one who smoked a few puffs and then put a cigarette away to smoke again. In the ruins of Hiroshima money was valueless and cigarettes took over as a medium of exchange. These thirty-five sen cigarettes will now bring three hundred to five hundred sen in Hiroshima. This morning, as though in answer to my silent prayers, a big shipment of military goods arrived. I was delighted to find that it contained mosquito nets and blankets—and shoes, both slippers and barrack shoes. I made sure the latter were distributed among the women. There were not enough blankets for everyone, so I requisitioned them for the hospital and distributed them to patients. One feature was common to all the patients who had died within the last two or three days: all had been less than a thousand meters from the hypocenter when the bomb exploded. It became apparent to me, therefore, that the nearer one was to the hypocenter, the more likely he was to die. Late in the night, Dr. Tamagawa disturbed my sleep to say he found changes in every organ of the body in the cases he had autopsied. Until now, we had interpreted the low white count as characteristic of the disease, but it became obvious that this was only one feature of a disease that involved platelets as well. Absence of platelets was responsible for hemorrhage and hemorrhage was the immediate cause of death. I had not used this toilet for some days I was shocked to discover how utterly filthy it was. It could hardly be called a toilet, for it consisted of loose boards thrown across a long hole dug in the ground. This hole was half full of undigested feces, scraps of paper torn from account books, medical journals, and even some pages from Krumpel’s Diagnostics, and dirty water from surface drainage incident to the heavy rain. The utter filth of the place was made more emphatic by the presence of a little frog who sat perched under a mass of straw matting in one corner. With no one to talk to I soon went to bed, but I could not go to sleep because the bed was still damp. Besides, I could not get the thoughts of Mrs. Chodo’s baby out of my mind. Thinking of her called to mind other orphans left by the bombing. There was an eight-year-old girl whose only home now was the hospital because her only relative, her grandmother, had died. There was a thirteen-year-old boy and his eight-year-old sister who had come to the hospital looking for their parents. They found their mother and an older brother but they both died, leaving these children alone in the world. Mr. Mizoguchi more or less adopted them. These children, attractive, well-mannered, and intelligent, became favorites of everyone in the hospital. Some old friends came in by twos and threes and we congratulated each other on being alive. Most of the morning I spent trying to arrange papers and collect the statistical data necessary to report our findings. Again, I got confused. Impatient to see the work finished, I neglected the work itself. I had, of course, heard people say the sky was beautiful, especially those who were as far away as Fuchu and Furuichi, but it was now, for the first time, that I could picture the cloud sharply defined against a clear blue August sky. It was at the moment of the birth of this cloud, with its ever-changing color, that Hiroshima was wiped out. It was at this moment that Hiroshima city, the culmination of many years work, disappeared with her good citizens into the beautiful sky. In general, I found those closest to the hypocenter to have the severest symptoms, and the greater the distance, the fewer and milder the symptoms. There were, however, a few exceptions. Some patients quite near the hypocenter had minimal symptoms and a nearly normal white count. By studying these cases individually, I found the reason. These patients had been shielded by reinforced concrete buildings, large trees, or other barriers. People had come to refer to “the mines of the town,” by which was meant articles of value buried in the ruins. Some made a regular business of digging in “the mines of the town.” At first, I felt this sort of thing was beneath one’s dignity, but the more I thought, the more interested I became. I picked up two new rumors when I made rounds today. One was to the effect that people coming to Hiroshima after the pika were now developing radiation sickness. The other rumor claimed that those who stayed in Hiroshima would become bald and die in a year. The patient census was still decreasing, but those who remained were stable or improving. It made us giddy to recall how our incomes had been taxed up to 80 per cent during the war to provide the military services with these supplies. Now that the war was over, perhaps taxes would not be so high. None of us thought about the matter of reconstruction. The longer we talked the more philosophic and optimistic we became. Late at night, we stopped with the happy thought that we could look forward to a better life in a peaceful country, with easier taxes, and no hard military police to lord it over us. Character cannot be improved by education. It reveals itself when there are no police to maintain order. Education is a veneer, a plating. Educated or not a man exposes his true character in times of stress, and the strong win. The proverbs invert and strength becomes justice, and birth more important than character. Force then rules the country. My stomach was better and my weakness so much less that I got up and went to the mess room for a pencil and paper. I wished to bring my diary up to date, for, after perusing Mr. Yamashita’s writings, I hoped I could avoid that confusion of thought in prose or poetry that comes from letting one’s thoughts go too long unrecorded. Screwing up my courage, I said to them in English: “How are you?” In answer, one of the officers offered me a cigarette. Timidly, I accepted it, and he lit it for me before lighting one for himself. The cigarette had a pleasing smell and the big red circle on his cigarette pack impressed me. We toured the hospital and I tried to show them everything I could, despite my weakness. After we had finished looking around and returned to the entrance of the hospital, they shook hands with me and, by way of a parting, said in Japanese “konnichi wa” instead of “sayonara.” Those who were standing around burst out laughing because “konnichi wa” is a Japanese greeting similar to “good afternoon” in English. I laughed, too, and the young officers laughed with me. They got in their truck with big smiles on their faces and waved until they were out of sight. I had just remembered that when the Americans came today I greeted them with a “good-bye” in-stead of the “how are you” I sprung on them later. The joke was on me! “I am a Buddhist,” I replied, “and since childhood have been taught to be resigned in the face of adversity. I have lost my home and my wealth, and I was wounded, but disregarding this, I consider it fortunate my wife and I are alive. I am grateful for this even though there was someone to die in every home in my neighborhood.” “I can’t share your feelings,” the officer replied, sternly. “If I were you, I’d sue the country.” The officer stood a while longer and gazed out the window. Finally, he and his party departed. After he had gone, I told my friends what he said. “Sue the country! Sue the country!” I repeated, over and over, to myself. But no matter how many times I repeated it, and however hard I thought, the statement was altogether incomprehensible. When I think of the kindness of these people, I think one can overlook thoughts of revenge; and even at this moment, I feel something warm in my heart when I recall those days and those friends.